Kakralomino: SPID! What do you think you are doing? Dr. Spid: What does it look like? Dr. Spid: I am leading your armies to victory for a change. Soon, Lanschilandia will be ours! Kakralomino: You will do nothing of the sort! These are my monsters and I'm taking over the invasion! 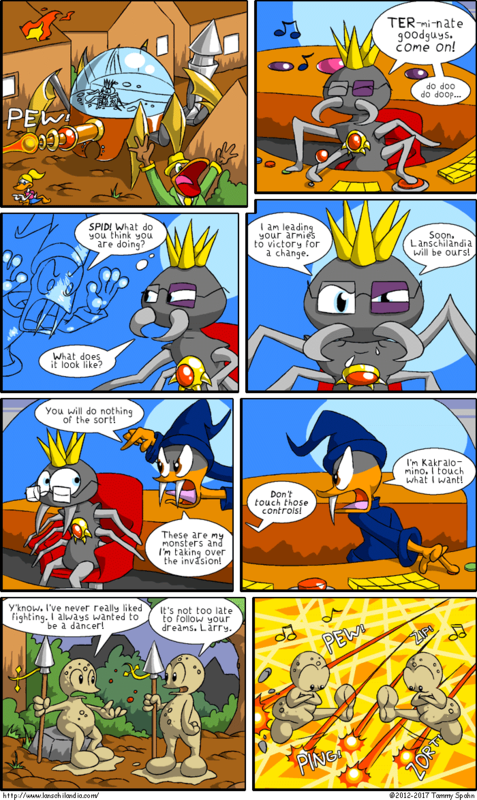 Dr. Spid: Don't touch those controls! Kakralomino: I'm Kakralomino, I touch what I want! Larry: Y'know, I've never really liked fighting. I always wanted to be a dancer! Sandman: It's not too late to follow your dreams, Larry. SFX: PEW! ZIP! PING! ZORT!